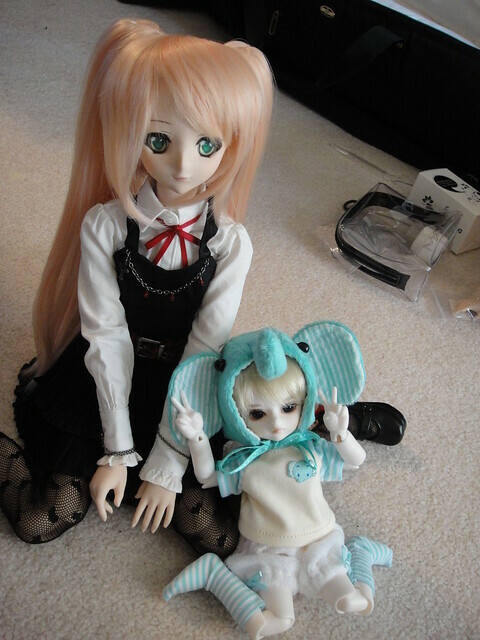 This was the first time I’ve brought any of my resin dolls out with me, but whitefrosty really loves Alisanne so I decided I’d bring her along. 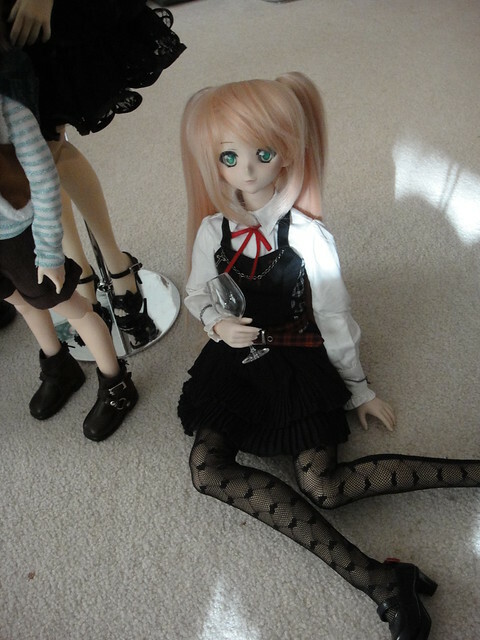 I was really nervous so I took a lot of care in packing her up: I wrapped her hands in bubble wrap, put on her face-guard and put her in her pillow from Volks before putting her into my Volks doll carrier bag. There was still room, so Gabrielle jumped in too! 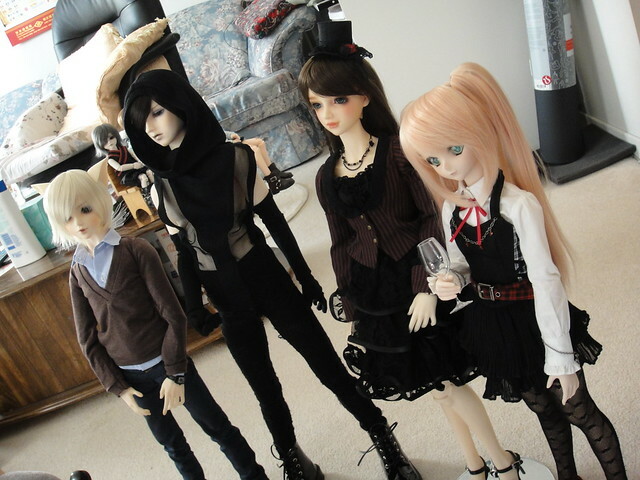 Here’s whitefrosty’s Kaede, KTCY’s B-Line Yuri, named Tatsuya, Alisanne and Gabrielle. 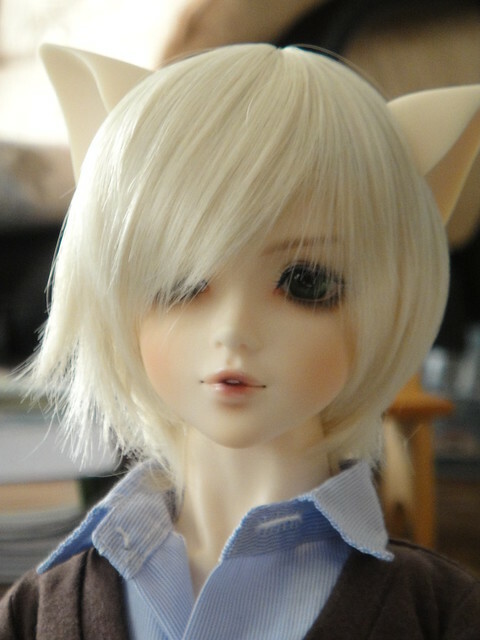 Kaede is such a pretty boy – he has such lovely features and a sweet face-up. I think his size would make a good addition to my family… someday. With his blue-green eyes and plump lips he looks like he could be Alisanne’s long lost brother. 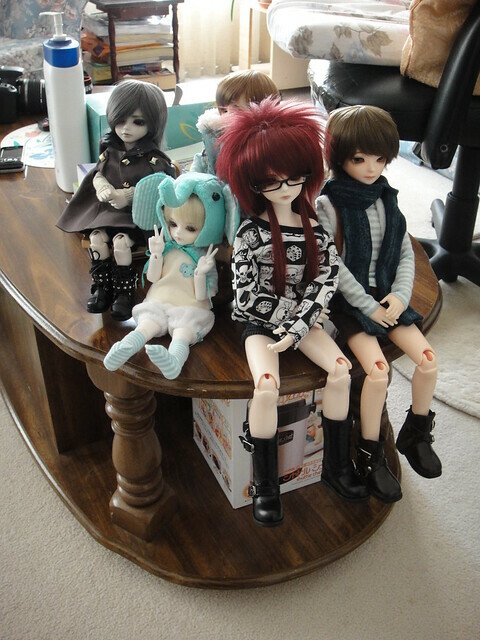 Here are the mini’s and tinies sitting on a side table. Aren’t they cute? 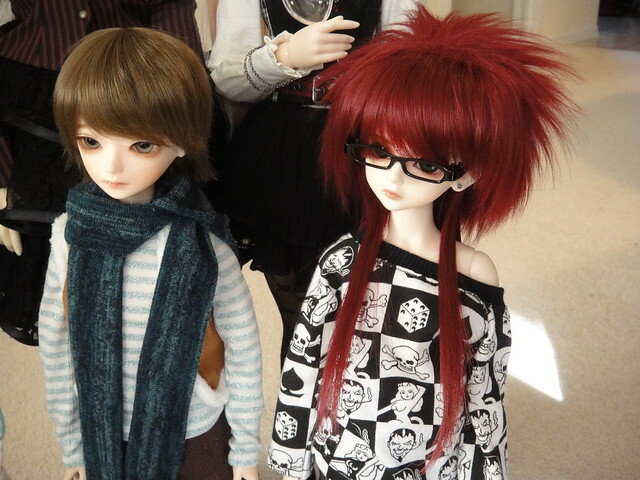 You might recognize whitefrosty’s Yukio and Myles from the meetup we had downtown over the weekend. These two boys are Louis and Mishka. Louis just got back from the “spa” a few weeks ago and looks fresh-faced and charming. 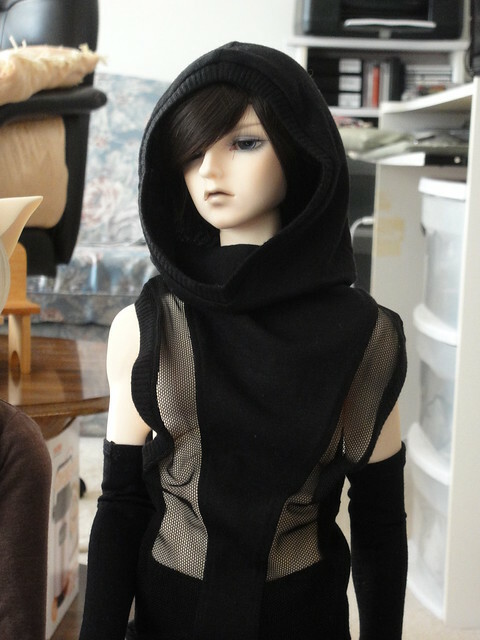 I mean, just look at his torso! It’s as big as the yo-SD’s! 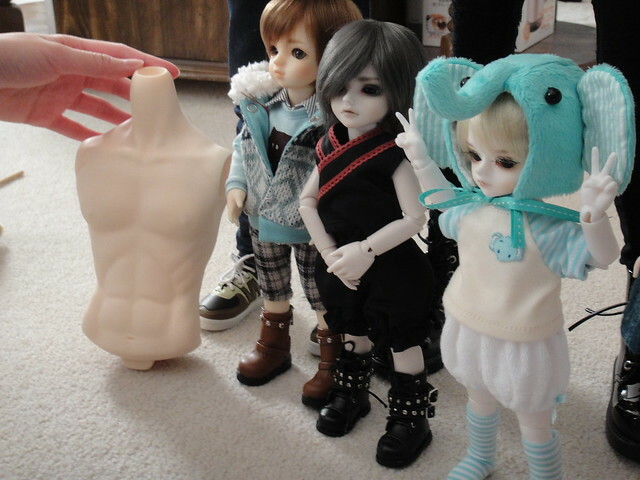 0__0″ (This was an extra “un-jointed” torso that was included with the doll as part of the Winter event). Gabrielle, did you drink too much wine? You can barely stand up! 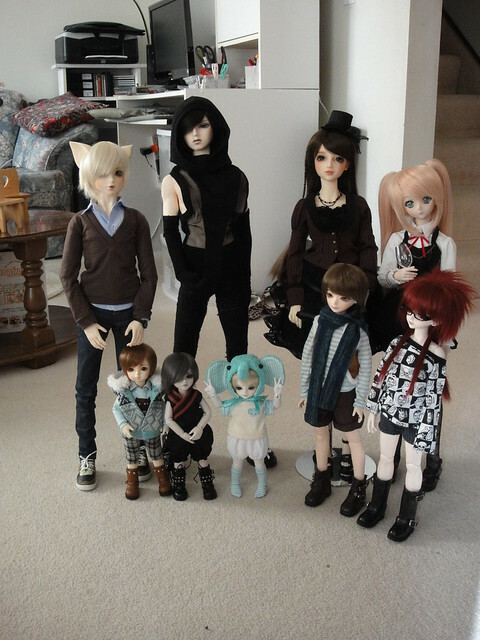 This entry was posted in BJD Misc, Doll Meetup, Dollfie Dream, Volks Super Dollfie and tagged Alisanne, Gabrielle, meet-up, whitefrosty by archangeli. Bookmark the permalink.